Morgan worries about Kiki, but Michael reassures him that her surgery went well, despite the fact that she still hasn&apos;t woken up. Michael says he&apos;s worried about Morgan, because of the suicide attempt. Morgan denies that, saying he was only trying to get some air and everyone overreacted. Michael says he recognizes the signs, since they went through it with Sonny. Morgan claims things aren&apos;t as bad as they were for their father and swears he wasn&apos;t going to actually jump. Morgan says he&apos;s back on his meds and all will be fine. Michael tells him that he could be charged with attempted murder for firing the gun at Dixon and his men. Carly sarcastically tells Sonny that she&apos;s going to donate the wheelchair since he doesn&apos;t need it anymore. Talk turns to Avery. Sonny says he won&apos;t be giving her back to Ava. Carly says they need to worry about Morgan. Franco tells Nina that he got a call from an adoption agency and wonders why, when they decided to put a kibosh on the baby thing. Nina&apos;s not ready to give up that dream, but Franco tells her no agency will give them a kid. Liz tells Jake that he&apos;s being released and going home today. She promises a welcome home party. Jake Facetimes Franco to ask if he&apos;ll be there for the party and then worries about having lost his bike in the accident. Jason and Sam wake up cozy on the couch and make out for a bit before Jason remembers that he has a son in the hospital and decides to head over there. Liz is walking by the room as he&apos;s leaving and is surprised to see him with Sam. Liz tells him that Jake is being discharged. After Liz leaves, Sam decides she should go home. She doesn&apos;t want to step on Liz&apos; toes, but Jason discourages the idea. Diane warns Carly and Sonny that Morgan may spend time in prison, because Paul needs a scapegoat and a Corinthos is the best kind. Carly&apos;s annoyed that Diane could keep guilty Sonny and Jason out, but can&apos;t keep poor innocent Morgan out of jail. Diane thinks she can get a plea agreement for probation if CarSon agree to supervise Morgan&apos;s outpatient treatment and be his legal guardian. Sonny&apos;s all for anything that will keep a Corinthos out of jail. This doesn&apos;t include not doing the crime in the first place. Nina complains to Maxie that she wants a baby, but Franco doesn&apos;t. She says he&apos;d be a great father. Maxie says she can hire a lawyer and do a private adoption, but that doesn&apos;t sit well with Nina. Maxie tells her to do it the old fashioned way. Nina says Britt told her she couldn&apos;t conceive. Maxie says she shouldn&apos;t trust anything Britt said and should get a second opinion. Franco show&apos;s up at Shriners with a bike for Jake, who is thrilled to receive it. Franco apologizes to Liz for overstepping, but wanted to make Jake happy. Jason and Sam arrive and he&apos;s not happy that Franco gave Jake a bike or that he&apos;s visiting. Liz points out that Jason has his friend for support and now she has hers. Morgan reassures Michael that he won&apos;t go to prison, because he&apos;s not a criminal, he just plays one on TV. Diane tells him about the plea agreement, staying out of jail and being under his parents guardianship. Morgan loves the idea, but Michael still looks worried. Carly tells Sonny that she can&apos;t go along with Diane&apos;s plan. They they can&apos;t help Morgan get better. She&apos;s upset that her kids grew up to idolize Sonny&apos;s business and feels someone else should be the one to care for Morgan. 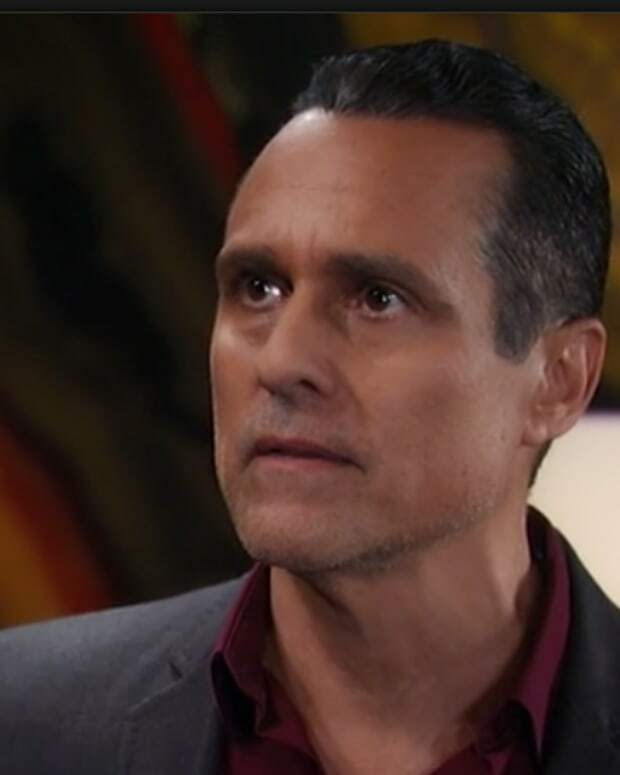 Sonny refuses to have Morgan committed.